Gov. Jan Brewer speaks to the media outside the University of Arizona Science and Technology Park Wednesday, July 28, 2010, following a federal court ruling blocking some of the key provisions of Arizona SB1070,. 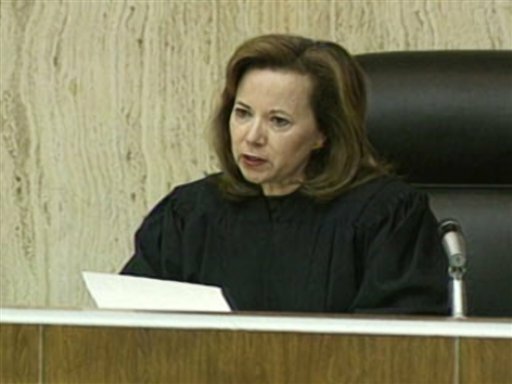 In this AP file photo U.S. District Judge Susan Bolton holds a hearing on immigration. A federal judge this morning blocked several critical provisions of Arizona's new immigration law from taking effect, delivering a last-minute victory to opponents of the law that brought the state a flurry of mostly negative international attention. • Allowing police to make warrantless arrests if there is a belief the person has committed an offense that allows them to be removed from the United States. The judgement is "virtually a complete win for the United States" and that the "heart of SB1070 has been enjoined," University of Arizona law professor Gabriel "Jack" Chin said. Even though provisions that make it a state crime to transport illegal immigrants and stop a vehicle to hire a day laborer are left in, Bolton's ruling gutted what made the law so controversial. "She went farther than I thought she would," said Chin, who has written two in-depth research papers on the law. Bolton rejected arguments by attorneys for the Department of Justice that other sections of SB 1070 are preempted by federal law. These include creating a separate state crime making it illegal to transport or harbor an illegal immigrant and changes in law dealing with impoundment of vehicles that are used to transport those not in the country legally. And Bolton noted that the Obama administration did not challenge several other provisions of the law. • Allowing Arizona residents to file suit against any agency, official, city or county for adopting policies that restrict the ability of workers to enforce federal immigration law "to less than the full extent permitted by federal law." In issuing the injunction, Bolton said attorneys from the Department of Justice showed they are likely to prevail on the illegality of the four sections when the case finally goes to trial. She also accepted the argument that the United States government "is likely to suffer irreparable harm'' if those four disputed sections are allowed to take effect as scheduled Thursday. The judge did not issue separate orders in the two other cases where individuals and groups also had sought an injunction, instead relying on the single ruling in the Department of Justice case. Sen. Russell Pearce, R-Mesa, who crafted the legislation, vowed an immediate appeal. "I'm disappointed Judge Bolton doesn't have more respect for the law, the damage to America" from illegal immigrants, he said. Pearce repeated his argument — the same one presented by John Bouma, the attorney for Gov. Jan Brewer — that everything in SB 1070 "is about enforcing existing law." The governor said she fully expects an appeal. Regardless, Brewer pointed out this is only an interim order, with the legality of SB 1070 to be determined after a full-blown trial. And she said Bolton, while "well informed and very thoughtful,'' is wrong in concluding the law goes beyond the legal authority of the state. "We feel very confident that the bill is constitutional and it is carefully crafted." But Attorney General Terry Goddard said the ruling is not a surprise. 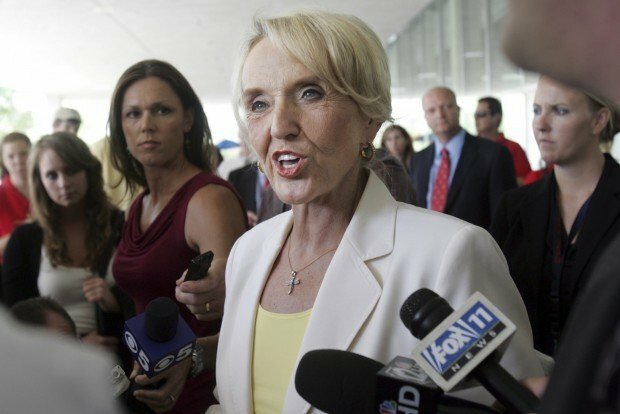 "Jan Brewer played politics with immigration, and she lost," Goddard said in a prepared statement. "Rather than providing the leadership Arizona needs to solve the immigration problem, Jan Brewer signed a bill she could not defend in court which has led to boycotts, jeopardized our tourism industry and polarized our state." Yet Goddard, before he was ousted from defending the case by Brewer, had insisted the law was legally defensible. In issuing her decision — and in picking and choosing which sections of the law should be blocked — the judge said she has "the obligation to preserve the constitutional provisions of a state legislative enactment." But Bolton said there are reasons why she enjoined the sections she did. The judge paid particular attention to the most widely-known provision of the law which says that when police have stopped someone for any reason, they must inquire about their immigration status if there is "reasonable suspicion" the person is in this country illegally. "Legal residents will certainly be swept up by this requirement," Bolton wrote, especially when considered in light of other requirements in the law "pressuring law enforcement agencies to enforce immigration law." "Certain categories of people with transitional status and foreign visitors from countries that are part of the the Visa Waiver Program will not have readily available documentation of their authorization to remain in the United States, thus potentially subjecting them to arrest or detention, in addition to the burden of the possibility of inquisitorial practices and police surveillance," the judge said. "The federal government has long rejected a system by which aliens' papers are routinely demanded and checked," Bolton continued. "The court finds that this requirement imposes an unacceptable burden on lawfully present aliens." Bolton had similar concerns with another section which says that all who are arrested cannot be released until their immigration status is determined. She pointed out that, under Arizona law, an "arrest" includes not just being handcuffed and taken to jail but even just being cited at the scene and released. In fact, she pointed out that Tucson police used this cite-and-release procedure to "arrest" 36,821 individuals during the 2008-09 fiscal year. The judge also said the requirement is likely to burden Immigration and Customs Enforcement which is legally required to respond to every request by a local or state agency seeking to verify someone's immigration status. That, Bolton said, "will divert resources from the federal government's other responsibilities and priorities." Bolton made short-shrift of the provision which makes it a violation of state law for anyone who is a citizen of another country to not have federally required documents. That section, in essence, would allow the state to arrest and hold illegal immigrants for violating Arizona law. The judge called that "an impermissible attempt by Arizona to regulate alien registration." Bolton separately said the state cannot make it a crime for illegal immigrants to seek work in this state. She said Congress never intended to criminalize such conduct but instead intended to focus its penalties on companies that knowingly hire undocumented workers. The judge said that means the state law "conflicts with a comprehensive federal (immigration) scheme and is preempted." Finally, Bolton struck down the provision letting state and local police make warrantless arrests of those they believe who have committed any crime which makes them removable from this country. The problem with that, the judge said, is that the laws which determine if an immigrant can be deported are complex. She said that's why the final decision is made by a federal judge. "There is a substantial likelihood that officers will wrongfully arrest legal resident aliens," Bolton wrote. “The court’s decision to enjoin most of SB1070 correctly affirms the federal government’s responsibilities in enforcing our nation's immigration laws,” said Department of Homeland Security press secretary Matt Chandler in an e-mailed statement. The Obama had administration has dedicated unprecedented resources to the border over the past year and a half and will continue to work to disrupt criminal organizations, focus on criminal illegal immigrants who pose a public safety threat and employers who knowingly hire illegal immigrants, he wrote. “We are focused on smart effective immigration and border enforcement while we work with Congress toward the type of bipartisan comprehensive reform that will provide true security and establish accountability and responsibility in our immigration system at the national level,” he wrote. Discuss today's court ruling with Star reporters and UA law professor Gabriel "Jack" Chin, an expert on Arizona's immigration law.